On Thursday morning, thousands of mourners gathered at the Staples Center to celebrate the life of slain rapper and community figure Ermias Asghedom, known as Nipsey Hussle. Public tickets for the official ceremony inside the arena were claimed within minutes of being made available online; more fans and supporters who were unable to secure the passes crowded on plazas and sidewalks of L.A. Live. Lauren London, Hussle’s long-time partner and co-parent, gave a poignant eulogy. She stood at the podium, dressed in white, eyes shaded behind black sunglasses, and spoke of her lost loved one–and, in particular, of her sadness that their now-2-year-old son will never really know his father. The ceremony was attended by many of Hussle’s collaborators and admirers in the music world, as well as friends and family. Vince Staples, Big Sean, and YG were among the mourners. Stevie Wonder and Jhene Aiko performed; Snoop Dogg and Louis Farrakhan were among those to deliver speeches memorializing Hussle. President Barack Obama submitted a letter, read at the ceremony by Karen Civil. 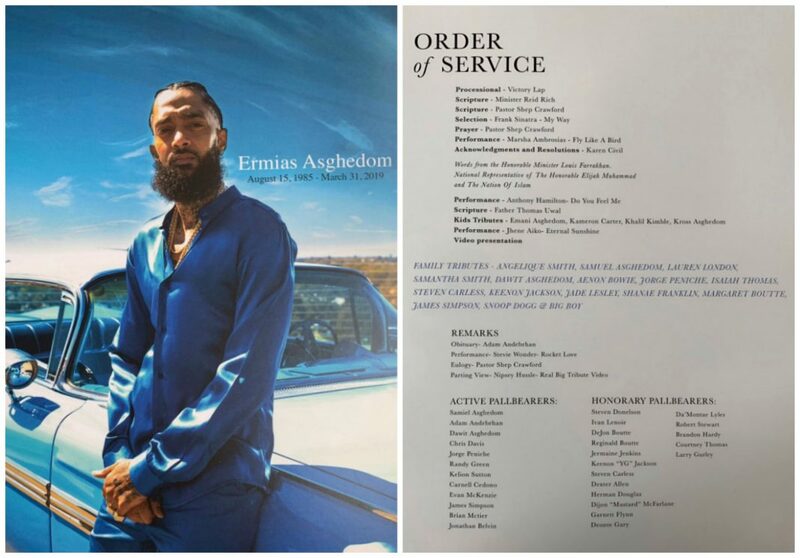 The program for the celebration included printed letters offering respects, penned by LeBron James, DJ Khaled, James Harden, Jay-Z, Kendrick Lamar, and others who felt profoundly touched by Hussle’s life.